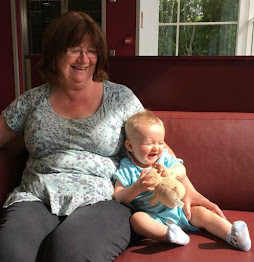 I decided to write A Guide For Absolute Beginners On Starting A Family Tree after reading a comment on a photo for #MySundayPhoto. The person commenting said that she couldn't start her tree as she only knew about her maternal grandmother and didn't know anything of her paternal grandparents and there was no-one to ask. My first thought was it's easy. You have so much information to start with. It would be different if you are adopted and do not know anything about yourself but if you have the basic information you can find your family tree. Where do you start? All the guides, mine included, say start with yourself and what you know. Unless your name is very common Smith, Jones etc this will lead you back into the past, via a few brickwalls of course. Just remember that researching your tree costs money. Certificates and subscriptions to websites are the first expense. I do not think you can do it for free so be prepared to pay something. For those of you who have no idea where to start this is how you do it. I have chosen John Lennon to show how it works using only the information that the person above had, that is, themselves, their parents and their maternal grandmother. I use ancestry.co.uk to store my tree online. It is expensive but they have so many records I personally think it's one of the easiest places to start a tree. You can also use ancestry at UK library's for free. I also keep a paper copy and a record on my computer. Either on paper or online write your name, date of birth (DOB) and who your parents are, then your grandparents until you get stuck. Include everything you know. Birth, marriages, deaths when and where. If you have birth or marriage certificates for anyone at all use these to add more detail. Go to the next generation that you have information for. In this case it is the parents, Alfred Lennon and Julia Stanley. Go to FreeBMD and look for them. In this case we are looking for Alfred Lennon and Julia Stanley's marriage. If you get no hits take out the first names and try again. We are looking for a marriage certificate because it will give their ages (approximately), their fathers names and occupations. 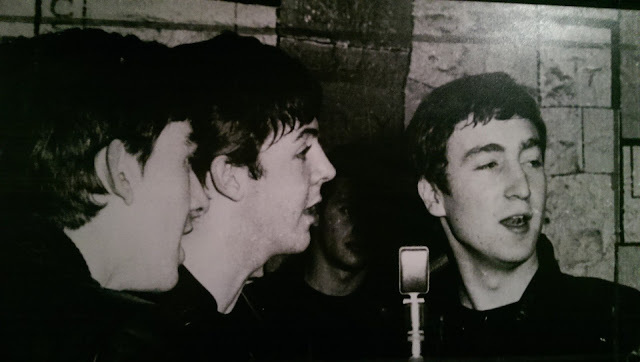 I had a guess that they married before John was born and put 10 years in. You may have to search wider to find yours. When I chose John Lennon as "me" I didn't know I'd be lucky and only have one hit. If you have more you will have to whittle it down by year and place. 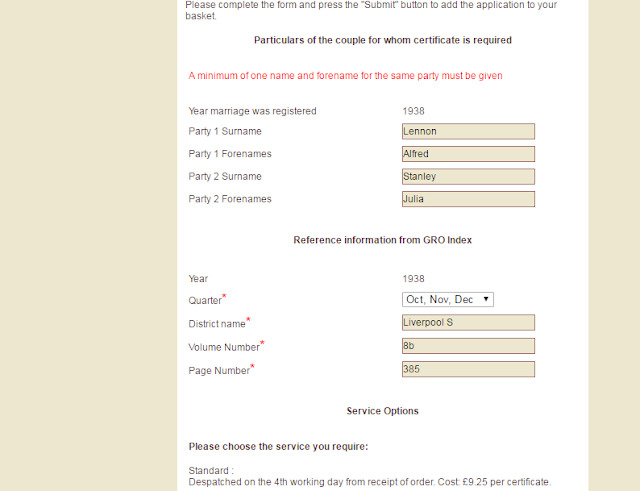 I now have their marriage details and can order the certificate from Gov.Uk. All the details are here that you need. It costs £9.25 to order a certificate and takes about a week to come. It will have the details of their fathers. I have purposely chosen someone famous so I do not have to order certs as the information can be found online. So a week later and now I have a certificate telling me who the fathers are so we can add them to our tree. It also gives the ages of the bride and groom so I have a rough idea when they were born. So now I can look for Julia's birth and her parents marriage and will be able to find her mothers maiden name and both their fathers. The marriage certificates will also give the fathers occupation. If I search for Julia Stanley in the approximate time range two names come up one born in Nantwich (Mothers maiden name not on the index before 1911) and one in Toxteth with the mothers maiden name as Milward. 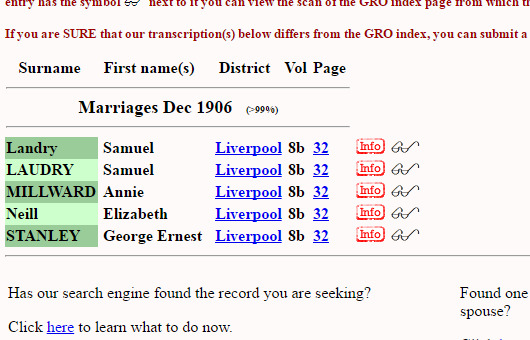 I think this is the right one due to the location, Nantwich is in Cheshire and Toxteth is in Liverpool, and so I check if there is a marriage of a George Ernest Stanley and a Milward. Here it is but Milward is spelt Millward. This is the first lesson in tracing family trees. If you can't find the record try changing the spelling. Now I have enough information to order their marriage certificates and find their fathers and their approximate ages. Keep doing this until you have relatives born before 1911. Then you can use the census to trace backwards. You can still order certificates but it does get expensive. On the paternal side I look for a birth of Alfred Lennon and find one in March 1913 Toxteth with the mothers surname as Maquire. 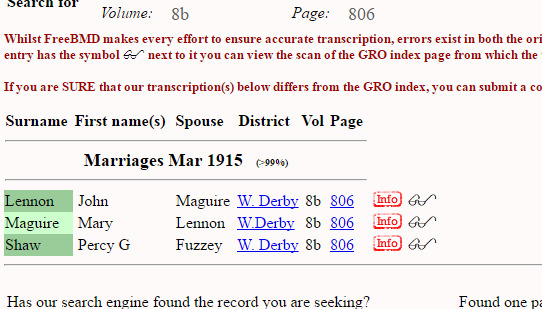 I then look for a marriage between a Lennon and Maquire and find one between a Lennon and Maguire in Mar 1915, another change of spelling. I would order both Alfreds birth and his parents marriage certificates to make sure this was correct. I now have the name of the paternal grandmother, Mary Maguire, and they were born before 1911. There are two things here which are interesting. The first, only three names appear on the index so one is missing. The name Fuzzey is next to Percy G Shaw but not listed on the index. The second is that in the census of 1911 John and Mary claim to be married for 17 years. If I check back to 1894, plus or minus a year or two, there is no marriage between a John Lennon and a Mary Maguire. There are four boys with them in 1911 one is Sydney Lennon so to check I have the correct family (as Alfred isn't born yet) I check for a birth of a Sydney Lennon. There is one, born Sept 1909 Toxteth Park. If I ordered his birth certificate I would find the maiden name of the Mary in the census and confirm this is the correct family. I chose Sydney, not George or Harold, because his name was more unusual and I hoped there would only be one result. Unusual names are the best aid to family research. There were census taken every ten years from 1841 through to present day. Before 1841 names were not recorded so are little use to genealogists and during the war the census was not taken. The census is only made public one hundred years after it was collected so we can view the 1911 census and further back. There was a register taken in 1939 and this is viewable for a subscription on findmypast. Living people are redacted (blacked out). I use subscription sites for my research as certificates are too expensive to keep buying and so much is on the internet nowadays. Searching on ancestry.co.uk I found this transcription. OK it's not the original but it helps me trace this family back another generation. If I click on Annie Millward it tells me her year of birth and father too. So we have gone back another generation. Just continue to trace each line back. Everytime you add a person to your tree ask yourself how you know that fact. Only add them if you can answer that question with a source, for example a birth certificate, and not "I think it's right". Good luck with your research. I hope this has helped and there are lots more tips to come on my blog. Just click on the family tree tab above. Do you have any tips on starting your family tree or do you have a brickwall that you can't break down? I really hope it helps and I'd love to hear how you get on. Good luck.